The following commentary is from the EWTN series, The Papacy: A Living History, The Papal Artifacts Collection of Father Richard Kunst. This artifact was featured on the fourth episode of the series, Popes of the 19th & 18th Centuries. A DVD of the series is available from EWTN. We can date this sword because we know that Italy suppressed the Papal States in 1870. 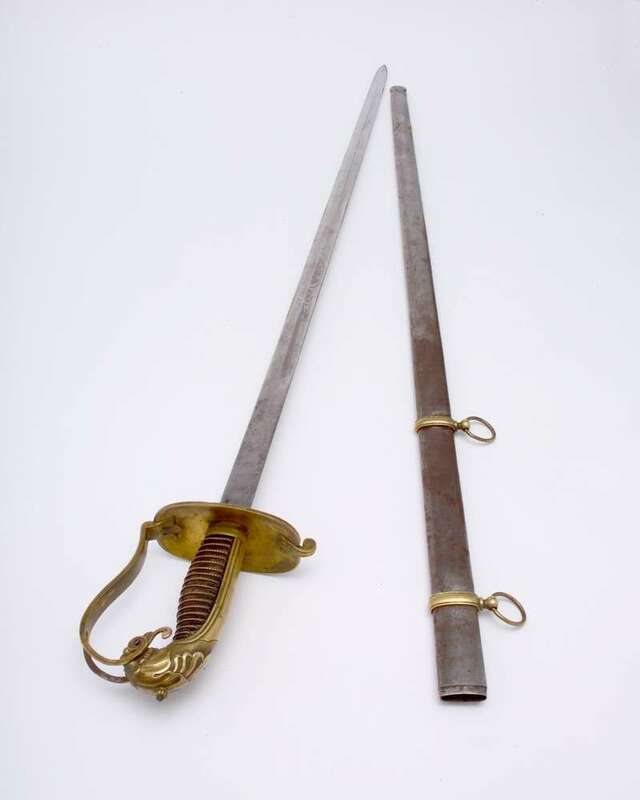 Up until 1870 this would not have been a ceremonial sword. It would have been a real sword, but then, when the peninsula of Italy suppressed the Papal States, all of a sudden the Swiss Guard took on a different meaning. It wasn’t an army, in the traditional sense of the word, although we still refer to it as an army. Being that this is a sword having the coat of arms of Pius IX on the blade, you can date it between the year 1870 and his death, which was 1878. So we know that this was produced and used by the Swiss Guard in a ceremonial sort of way some time in those years. The reality of the Swiss Guard is even though they function much as a ceremonial unit, the fact is they are trained to use weapons to protect the Pope if the need arises. But between 1870 and 1878, the Guard was just trying to find their way again with a whole different reality. So how they were using these items and what their mind set was at the time is probably different than what it is today. The blade has an image of his coat of arms on it. The top of the handle is made in the image of a lion’s head, reminiscent of the two lions in his coat of arms. So that is the significance of the lion’s head on the sword. The sword also has a sheath, and both sword and sheath are in perfect condition. Also, I was very curious when I went to the Swiss Guard Armory. I have had the opportunity to visit it many times to see the items they have in relation to the ones I have. I found that they have only four of this type of sword left when at one time they must have had hundreds. Since Pope Pius IX founded the North American College in Rome, lions are very prevalent in his coat of arms there, too.